With over 2,000 likes on Facebook (where it is glibly listed under the category “Wine / Spirits”), many may still be unfamiliar with Great Moments in Leftism, an amateurish strip by a self-confessed bad artist. With an accompanying blog that only dates back to April, this nascent phenomenon in left-loathing has yet to let the echoes of the internet bring its natural audience out of hiding in the squats, university classrooms and purposeless circle-marches that constitute their natural habitat. But with a willingness to speak truth to power, albeit in a state of relative anonymity, it’s only a matter of time before strips from Great Moments in Leftism make their way onto Facebook pages and the doors of grad students’ shared office space everywhere. 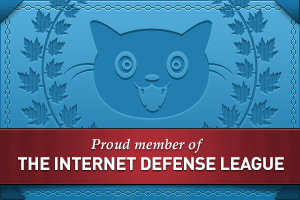 Activist affiliations are as logical and easy as checking a couple of boxes! It’s funny because… it’s true? Although the acid tone mocks leftist tropes and organizations with enthusiasm, the author demonstrates such a familiarity with their subject that they must either have a background on the radical left or be a singularly dedicated hater. Just about every left group is sardonically skewered by the author, with many comics fixing a single organization – the IWW, Kasama Project or the International Socialist Organization – in the crosshairs. The best comics, however, identify tendencies on the broader left and cast them in the awkward limelight of absurdity. For example, the man in the above comic (complete with creepy John Waters moustache) identifies as an organizer. That this role seems to consist mainly of insular participation within existing activist circles, falling short of actually organizing any communities, seems lost on him. The buttons on his chest demonstrate the easy retail nature of the activist identity, advertising to like minds that here is a person who has dropped by the bucket of pins offered at their student union and fished out the best of the bunch. Left implicit is the idea that the ‘organizer’ identity is so insular that it precludes the possibility of actually organizing anyone who doesn’t already attend your reading circle, punk show or vegan potluck. What are you thankful for, Grandma? The theme of the activist as The Other makes another appearance in this comic. A cross section of apparent radicals at their respective Thanksgiving dinners are seen scolding the rest of the table. The politics of the comic as a whole suggest that the author is sympathetic to critiques of colonialism and consumerism such as those offered in the comic. But the implicit critique in the previous comic – that activism is an insular, primarily social activity with no potential for mass struggle – is made all the more evident. Not for nothing does Google turn up 13 million search results for ‘surviving Thanksgiving’, many of which emphasize the importance of avoiding politics. Whether the author thinks activists should hold their tongues or seek more constructive engagement on holidays, the contempt for humourless blathering is everywhere evident. If the left misses opportunities to engage with a broader community, as the author sometimes seems to suggest, there are evidently reasons why. In this comic, a smug union staffer is seen explaining to a handful of labour protesters agitating for higher wages. Even the status of the protesters as workers or merely fellow activists is left ambiguous, but one thing is not: the character of the event as a stage-managed show for the media. As the union staffer makes a self-congratulatory exit, he reflects happily on his prospects for career advancement. The theme of careerism in the left is a frequent subject of criticism, and while it is often directed at those who put financial advancement ahead of the movement, it is sharpened here to demonstrate that certain types of organizing may do more for the organizers than any intended beneficiary. Of course, even organizing ‘the left’ to come out in any collective capacity is like herding cats. The point is ably made in this comic, where a group of leftists holding a banner calling for left unity scowl at one another. Barely able to share a banner, how are these men meant to accomplish its stated purpose and unite the left? The fact that they are all men does not seem incidental, as the comic does regularly feature women. Without knowing for sure if the decision is deliberate, it seems unlikely the endless echoes across the radical left that feminism is divisive would have escaped the artist’s notice. But then, the idea that misogyny is the real divisive force on the radical left never quite occurs to figures like the ones in the comic. “Whither the left?” seems to be the snarky inquiry on the tip of the artist’s pen. The answer that flows forth is left to the individual interpretation of the reader, but a common theme seems to emerge: we are going in smug circles. 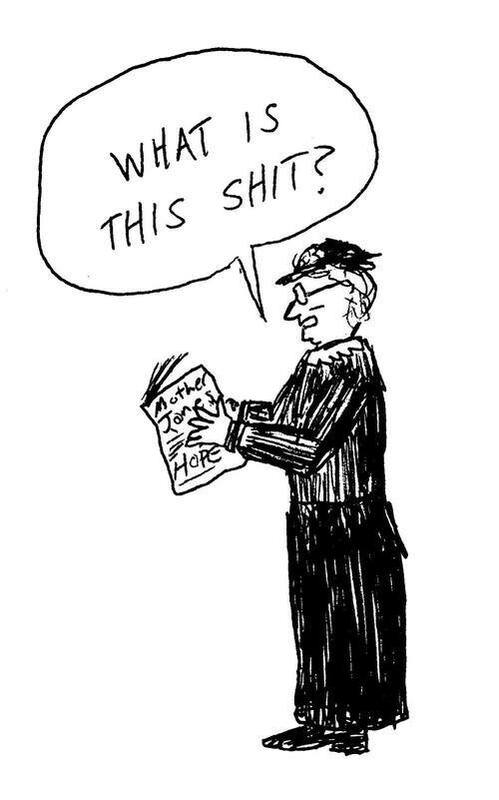 The idea is perhaps most succinctly captured in this comic. A man in a flannel shirt and flat cap holds a sign denouncing capitalism, with the initials of the International Socialist Organization on it. When the last panel closes on his face, he reflects contentedly that he’s in the class struggle, though by all accounts he appears to simply be at a protest. This is the recurrent theme of many of these strips: whatever our grouping or politics, we have become content with the ritualized politics of symbolic dissent. To many, there would be nothing immediately laughable about the man’s belief he is in the class struggle, and a few comments on the Facebook page complain of not getting the joke. Maybe the best explanation is the commenter who simply said “Still feels damned good.” True as that may be, Great Moments in Leftism seems calculated to disrupt our pleasant reverie and ask the uncomfortable question: What are we doing wrong? 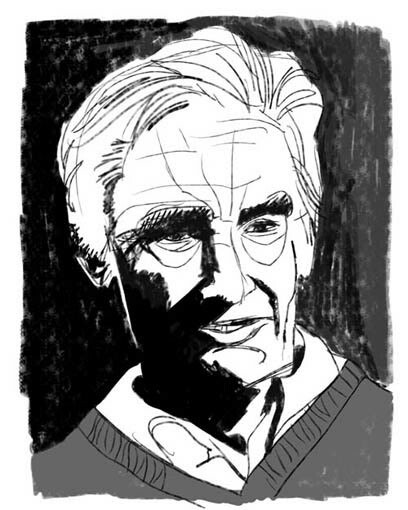 It was two years ago this month – on January 27, 2010, that Howard Zinn passed on. He was 87 years old. While he was arguably the most important American historian of the 20th Century and wrote a library of work–including his milestone, A People’s History of the United States–a fun fact is that the last publication he released during his lifetime… was actually a comic book. The gravity of Zinn’s legacy tends to make singular reviews of his work impossible. A review of one work necessitates a contextual understanding of his life as a radical historian who in turn, participated in making history during his own time. That being said, I will assume that readers will go elsewhere to get their crash course on Zinn, so my review stays under 10,000 words. This book is beautifully presented. It is now available in soft- or hard-cover, and at about 12″ x 20″, is a little too big to comfortably sit in my lap as I’m reading it. My assumption is that the creators chose a larger format because the work is so text-heavy. That text is important, because Zinn is arguing a still-contested notion, and needs as much evidence to back up his arguments as possible. It begins with the annexation of Indigenous lands across what is now North America in the later 1800’s, and takes us to the present post-9/11 era of relative global military hegemony. 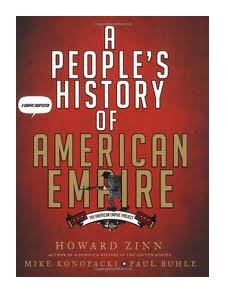 Zinn’s thesis is relatively clear: all of modern U.S. history is a history of empire; however, there is a parallel history of life and resistance by many. This includes poor and working people, who have played major rolls through unions, churches, and other community groups; women, students, and minorities of many stripes have all had interesting parts to play in a history that is largely told, in Zinn’s words, from the perspective of only “certain white men” (implying the rich and powerful). Compared to A People’s History of the United States, which first appeared as a piece of academic achievement, American Empire reminds me more of a documentary film. Zinn is shown giving a lecture at an anti-war event, introducing and concluding the book’s chapters, which jump to varying times and places. Major historical figures like Black Elk, Mark Twain, and Eugene Debs are in these chapters, speaking as if to the reader, in scripts pulled largely from their real-life quotations and writings. The creators have chosen to accent this large-scale historical narrative with Zinn’s own personal history, as a young unionist, a WWII Air Force bombardier, and finally, as a young radical professor during the Civil Rights and Vietnam War eras. What you get here is an interwoven account of his research and his own personal account of the 20th Century. It’s a moving way to look at a history that was told to most of us very differently in school. Visually, it’s all a lot to take in, especially if you want to appreciate the illustrations as well as the text. I see this book being most appreciated when you can read it in segments. This makes it perfect for classrooms or study group. Each chapter is about 6 pages. But just because I support the work in principle doesn’t mean the review is all roses, right? I have a few critiques of the book, rooted in my perspective as a comics lover + writer, and as a history enthusiast who cannot overestimate the impact Howard Zinn has had on my education. I’m not a fan of comic book adaptations–of books, movies: anything. My experience with them has been largely that they are a lose-lose product: the comic book becomes a simplified medium for what was in its first stage a more complete and highly-developed creative product. (Insert any comic book adaptation of anything here: Game of Thrones, The Last Unicorn, Ender’s Game, etc. etc. etc.) On the other hand, the comic medium is dis-serviced by simply being a highly-saleable vessel by which to re-release something that’s already out on the market. In short, if you’re doing a graphic adaptation, you’d better be bringing something incredibly special to the table. 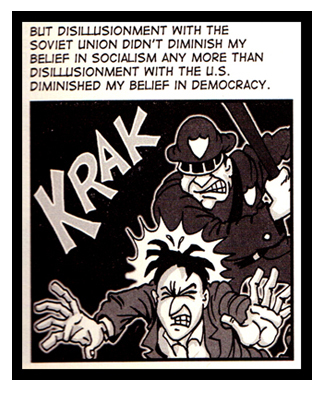 In this regard, I think this graphic adaptation of Zinn’s past work has both some hits and misses. First, let’s talk about the hits. 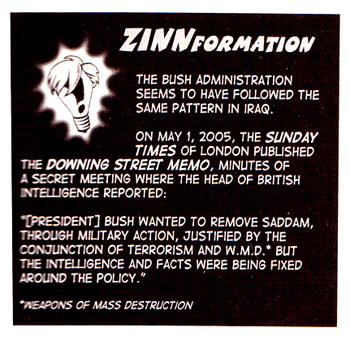 (+) Of course, a comic book makes available a lot of the information that Zinn has, largely, buried in pages upon pages of academic text, filled with all the usual footnotes and supplementary reading. So it’s accessible, and that’s especially important to young adults or classroom settings, as I mentioned before. (+) The book does in fact compile some new information, largely the primary sources used to assemble its “interview”-styled segments with historical figures like that of Mark Twain shown above. That and the additions of Zinn’s personal experiences make it a more colourful work than any *one* of his texty-texts. (+) Some of the graphics that have been added to this volume, including the contemporary photographs, political cartoons and other artwork of the time does much to enrich the narrative. It’s always illuminating to have this kind of media–text is, after all, highly prone to editorialization–but a photograph or political cartoon can reveal something of an un-altered reality for the time period. Now, some of the downers. (-) Personally, I find the cartoon-ish fashioning of the illustrations to be a little out of the mood of the book. This is a serious, often grim, telling of American history–there are many chapters that would have rightly moved me to tears, if not for drawings that look like they came out of a storyboard for Quick-Draw McGraw. I would have gone with a different overall style. Still, even if the manner isn’t to my liking, at least it’s consistent, and professionally rendered. (-) Many graphics are modified photographs–that’s fine–but what irks me is that whoever photo-shopped them didn’t clean them up. It’s like writing a milestone book and then not bothering to format it properly. I don’t know why political comic books continue to disappoint me in this arena. It’s as if they see the quality of form and content as mutually exclusive. Or they think that readers just won’t care. But for comic book connoisseurs as well as artistically-minded comic readers, this is what ultimately determines the quality of the work… i.e. the amount of love that went into it. …first I gotta to drill into your heads, again, why Howard Zinn was (and IS) so important. Don’t worry, it won’t take 10,000 words. As I touched on before, when A People’s History of the United States was published in 1980, the words “People’s History” were neither a mainstream term nor a methodology. Academically speaking, it was a new argument: History didn’t have to be that of kings and “great men”, or, as Henry Kissinger put it, “the memory of states”. It was revolutionary. He introduced the historical equivalent of ‘the 99%”–an overwhelming proportion of human history sits in the stories and memories of common folk–and it was right under everyone’s noses, being largely ignored. Audio renditions of his work are narrated by Matt Damon, Viggo Mortenson, and others moved by his work. What we are reviewing here is one of those publications. There is no other historian, mainstream of no, who can claim such a franchise, nor such a significant intellectual imprint. – Creators/editors who lack experience in comic books (lots of indie/underground comics, as well as quite a few political comics, whose creators are firstly activists or academics; not comic book-makers). This often points to a lack of necessary funds and time. With People’s History of American Empire, with all due respect, a little may be true of both. But it kind of doesn’t matter what I think. At the end of the day, what’s important to me is figuring out what the end user (the reader) is thinking; and that’s what I’ve tried to do here. Why does it concern me? Because I would never want someone to read this book and find out that their lasting impression of a work was “rushed attempt to make money”–when its origins are so profoundly the opposite in motivation. Political comics will catch on. As the importance of non-fiction comics grows, more and more investment will be put into making a product with a cause that is indistinguishable from the mainstream players. But for now, the fact that this is one of the most well-circulated political comics of the past few years shows that we’ve got a little ways to go.